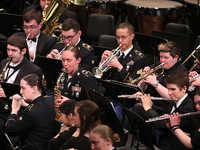 The 399th Army Band from Fort Leonard Wood, Missouri, will join the Missouri S&T Symphonic Band and Wind Symphony for a FREE concert at 2 p.m., Sunday, Feb. 17, in Leach Theatre of Castleman Hall. Admission is FREE but tickets are required. Tickets may be picked up on the day of the concert or in advance by contacting the Leach Theatre Box Office at 573-341-4219. Tickets may also be picked up during regular box office hours Monday-Friday, 10:00-4:00.